The third and fourth grade music concert is tomorrow at 7:00. We will be heading to the high school tomorrow morning for rehearsal. In science last week, students had the opportunity to observe some minerals, including quartz, mica, feldspar, and hornblende. They also observed pink granite. After noticing that pink granite contains pieces of the other minerals, we came to the conclusion that rocks are made of minerals. We are also exploring weathering (the breaking down of rocks). Causes of weathering include ice, plant roots, water, and wind. In reading workshop, students will continue to study an animal with their research groups. They will read books and practice different note-taking strategies. In writing, we are studying literary essays. We are reading picture books and studying characters in the stories. Students will write another literary essay by forming an opinion about the character and then supporting their idea using evidence and details from the story. This week, students will learn how to incorporate exact lines from the text using quotation marks. ​In math, we will continue to study the attributes of two-dimensional shapes. We will also find the perimeter of different polygons. Please remember that students should bring their biographies to class by next Monday. There will be one more opportunity to check the Roosevelt library this Thursday. In reading, we are beginning a new unit called Research Clubs. I will divide the class into small groups and give each group books about a specific animal. Students will learn to take notes and organize their notes into different categories. Eventually, each group will have the opportunity to create a presentation for the class to share its learning. Information about a biography/wax museum project is being sent home today. Please read the letter carefully and take note of important dates. Thank you so much for your support of this project! In writing, we will start a short unit on literary essays. This unit teaches students to notice traits about characters, form opinions, and share these opinions in writing using evidence from the story. The new spelling words were sent home the Thursday before spring break. A few students forgot to check their mail before break, so your list may be coming home tonight. Please let me know if you need another copy. Have a great week! There is no spelling test this week. I will hand out the new words this Thursday for the test that will take place after break. If the list gets misplaced over break, please let me know and I will give you another copy in April. This week's reading slips for March is Reading Month are due Wednesday. Keep reading, as our class is challenging Mrs. Mitchell's class to see which teacher will have a spot in the shooting tournament! There is a math test tomorrow (Tuesday). The study guide is also due tomorrow. This Thursday is a half-day and there is no school on Friday. In reading, students will be looking for themes and lessons in their stories. We will also continue to do work out of our test preparation packet (reading passages, answering questions, comparing passages). This is good comprehension practice and good practice for the M-STEP test that is coming up in May. Please encourage your child to continue reading at home and recording his/her minutes on the March is Reading Month slip. In writing, we will focus our attention on grammar - capitalization, punctuation, and spelling. This will give students one last opportunity to edit their non-fiction books and apply the grammar skills we have learned. Because of snow days and missed school days, there will not be time to write final copies of these books but we will still celebrate the work done in this unit. In science, we will learn about forces that affect motion, including gravity and friction. We will also learn about balanced forces and unbalanced forces. With the M-STEP state assessment coming up in May, we will take some of our reading time to practice test taking skills. We will read paired passages - passages that are placed together because they have something in common - and complete short response questions while incorporating information about both passages. Please encourage your child to continue reading for March is Reading Month and recording their minutes on the slips that are sent home each Friday. I found a few blank slips on the floor, so please let me know if your child needs another one for this week. 4 x 8 = 16 x 2 True or False? 3 x 3 = 9 x 4 = 36 True or False? What is motion? How do you know movement occurred? In math, we will practice drawing arrays to represent division story problems. In the picture on the right, each dimension has meaning - the height (4) represents how many balloons each child receives, and the width (9) represents the answer to the problem - how many children were at the party. Students will also write their own multiplication and division story problems and then solve each other's problems. In reading, we will finish Because of Winn Dixie and discuss the themes and lessons in the story. Since the author does not directly state the themes and lessons, we must think critically and piece together clues to discover them on our own. In writing, students will create a text feature for each chapter in their non-fiction books. Text features could include diagrams, graphs, maps, etc., and they should teach the reader additional information about the topic. In social studies we will finish our study of Michigan's economy by discussing specialization. For example, due to climate, Michigan depends on Florida for certain crops while Florida depends on Michigan for other crops. We will also discuss entrepreneurship. The March is Reading Month challenge has started! You should have received a letter, a calendar, and a slip for tracking minutes last Friday. Please encourage your child to read and record their minutes this month! We are competing against Mrs. Mitchell's class to see which teacher will compete in the shooting tournament at the end of the month. In math, we are starting a new unit on multiplication and division. Whatever time can be spent at home practicing multiplication and division facts would be very helpful to your child. There is a link to the multiplication strategy posters at the end of this newsletter. If your child is multiplying a double digit number by a single digit number while completing homework, please consider the strategy in the picture. Simply multiply the tens place by the second factor, multiply the ones place by the second factor, and add the products. In writing workshop, students will have a few more days to finish drafting their informational books. Then we will focus on making revisions and finding ways to improve the writing. It is great for students to understand the importance of revision in the writing process. As a class, we are reading Because of Winn Dixie and using it to study characters. We are learning to draw conclusions about characters based on the things they say and the way they act. We are also learning to make predictions by considering how characters have reacted in the past. 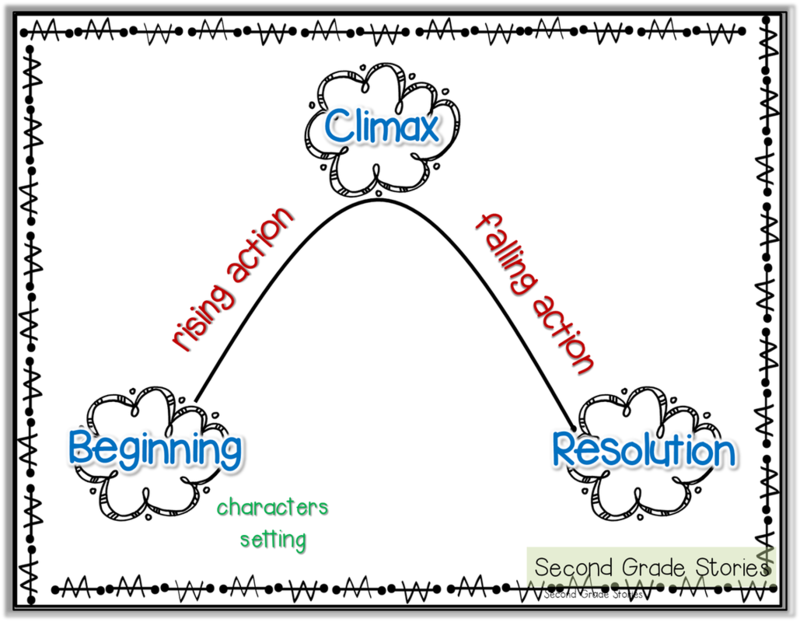 Finally, we will be studying the plot story mountain (the character's problem grows and grows until there is a climax and then the problem is resolved). Every day, students have time to read their own stories and apply the same skills we practice together. In social studies, we will explore five types of economic activity in Michigan: manufacturing, services, agriculture, tourism, and research and development. In social studies, we will be studying Michigan's economy. 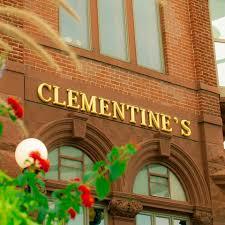 Creating advertisements for Clementine's was a great introduction to this unit. Now we will discuss Michigan's natural resources and how they are used in the production of goods. We will consider the human, natural, and capital resources used in companies such as Kelloggs and the Ford Motor Company. In math, we will be using pattern blocks to compare fractions and find equivalent fractions. In reading, we will finish our non-fiction reading unit by reading multiple articles about roller coasters. Students will practice summarizing and synthesizing (using multiple sources to respond to a single question). If your child is making Valentines for classmates, please have him/her bring them to class on Thursday. We will distribute them sometime during the day. Welcome back everyone! The spelling test from last week was postponed to this Thursday. Please let me know if you need another copy of the words. We are starting an exciting new social studies unit on Michigan's economy. We will discuss supply and demand, and how it affects prices. We will also discuss how businesses can increase demand (advertisements, sales, new products, spokespeople...). To make this learning even more relevant, each student will be creating an advertisement for Clementine's restaurant in South Haven as a part of The Herald-Palladium's Creative Kids campaign. Clementine's will then choose its favorite advertisement from our classroom to be published in the Herald-Palladium. All of the work for this project will be completed in class this week. In math, we will be solving story problems related to mass and volume. We will also be learning to compare unit fractions. A unit fraction is any fraction with one in the numerator (1/2, 1/3, 1/4...). In reading, we will be studying narrative non-fiction books such as biographies. Similar to fictional stories, when we read biographies we must pay attention to the story elements - character, setting, and plot. I look forward to meeting with you this week at our winter conference. Have a wonderful week! I hope you had a wonderful weekend! Information about Winter Conferences was sent home on Friday. Thank you for signing up for a time slot online. In reading, we will be investigating text structures of different non-fiction texts. For example, some texts are organized by categories, with chapter titles and headings acting as main ideas. Other texts may be organized by cause and effect, or by chronological order. In writing, students are finishing their opinion papers about a favorite book, movie, or television show. In math, we are studying time, measurement, and fractions. Students should be able to tell time to the nearest minute. They are also gaining familiarity with units used to measure mass and liquid volume. In science we will learn that sound is caused by a vibration and that sound travels in waves. I have encouraged students to start making progress on their instruments since they are due next Tuesday. Remember, instruments can be made of simple materials from around the house. Students take the computerized NWEA test in the fall, winter and spring. They will take the reading portion of the test tomorrow and the math portion next week. Boxes and Bullets is a reading strategy used to record main ideas and details. There is a math test this Thursday on addition, subtraction, and rounding. The study guide is coming home today and it is also due on Thursday. Since there will not be time to check over the study guide together before the test, please encourage your child to let me know this week if he/she has any questions. We are also beginning Unit 4, which focuses on telling time to the nearest minute and measurement. In writing, we will practice structure and organization. I will ask students to choose a favorite book or movie and then write a paper to argue why it's the best. We will be working on using a topic sentence for each paragraph, like Elf is a funny movie. Then we will work on using details to support the topic sentence, like Buddy found gum underneath the hand rail and put it in his mouth, and Buddy poured syrup on his spaghetti. In reading workshop, we will continue to study non-fiction texts. Key concepts include using titles and headings to predict main ideas, using text features to gather information, and summarizing parts of the text using a strategy called Boxes and Bullets. This strategy helps readers to record the main idea of a passage (the box) and details that support it (bullets). This is similar to our writing skill this week. In science, we will learn more about light by investigating shadows, reflection and refraction. We will also look ahead to the second part of this unit: sound. As we learn about sound, each student will be creating a musical instrument at home to bring to school and share with the class. Information about this project is being sent home today. Instruments can be as simple or as intricate as students would like. After reading the letter this evening, please let me know if you have any questions. There is no spelling test this week, but new words will come home on Thursday. Have a great week! In reading workshop, we are beginning Unit 3, Reading to Learn. After studying fiction and mysteries, we now have the opportunity to learn strategies for comprehending non-fiction texts. Over the course of the unit, we will do work with main ideas and details, text structure, and gaining information through text features such as headings, charts and bold words. In math, we will continue to practice addition and subtraction using the number line and place value strategies. I will also introduce students to the standard algorithm for addition (traditional carrying method). Some students will master this strategy by the end of the unit, but others may need more practice throughout the year before they are able to apply it consistently. In writing, students will finish drafting and editing their persuasive essays. Some students are struggling with the organization of this piece, so I will provide them with a graphic organizer and give them another chance to organize and draft their ideas. In reading, we will finish the mystery unit and take some time to apply the skills in the context of an assessment. We have also been using Study Island, an online program, to practice reading skills and test taking strategies. Study Island can be used at school and at home. I will be providing more information about Study Island in the next couple of weeks. We will switch our focus to science this week. First, we will discuss animal traits. Each animal has different traits that help it to survive in its habitat, like how a bunny's eyes are on the side of its head in order to detect predators. We will explore camouflage and mimicry, and also investigate other survival behaviors such as migration and hibernation. In math, we will use the number line to solve subtraction problems using two main strategies: differencing and removal. Differencing is an efficient strategy when the numbers are close together. Start at the smaller number and count up to the larger number in order to find the difference. Removal is an efficient strategy when one of the numbers is small. Simply remove that number (go backwards) on the number line. An example of each is shown below. ​Please remind your child to turn in his/her Book-It calendar for November if it is complete. In math, we will begin Unit 3 which teaches strategies for triple-digit addition and subtraction. I am sending home the Family Letter today to provide an overview of the different strategies, including the standard algorithm (borrowing and carrying). This algorithm will be taught near the end of the unit, but feel free to practice this strategy at home. Students will also learn to round to the nearest ten and round to the nearest hundred. In reading workshop, we will learn how all of the skills and strategies we studied during our mystery unit can also be transferred to any fiction story. For example, just as we look for clues to predict who committed the crime in a mystery story, we should look for clues in any story to predict what will happen next. In writing workshop, students continue to work on their persuasive essays. I am helping them to find facts and statistics to strengthen their arguments. It has been fun to see students engaged in these topics that they have chosen, such as: People should spend less time on their phones, People should recycle, and People should not hunt wolves. In social studies, we will finish our study of Michigan's history. We will briefly discuss the Revolutionary War, why pioneers came to Michigan to settle, and how Michigan finally became a state. I handed out the new spelling words on Tuesday, November 20th before break. Please let me know if you need a new copy. We had a wonderful field trip to the Sarett Nature Center! We will continue to study Native Americans and their positive interactions with the French explorers (in large part due to the fur trade). We will also discuss how everything changed once the British arrived and wanted to take part in the fur trade. In reading workshop, we will learn to recognize text signals. Different parts of the text can signal for us to slow down, reread, make movie, or collect information. If we can recognize those signals and apply the correct strategy, it improves our comprehension and recall. There is a math test this Thursday. I handed out the study guide before the weekend in case anyone wanted to start working on it. The study guide is due Wednesday. Whatever practice you can do at home with multiplication facts would be very helpful to your child! On Wednesday, there will be an all-school photo taken from the rooftop, and students will be organized in the shape of a heart. Third graders are invited to wear red shirts that day if they would like. I look forward to meeting with you at fall conferences this Tuesday and Thursday! In reading workshop, we will practice strategies together as we read our second mystery, The Whodunit Detective Agency: The Diamond Mystery. Students will also read their own mysteries that I have chosen for them. Many students have already finished a lot of different mysteries in this unit! In social studies, we will continue to study Native Americans. We will learn about how the Native Americans used nature, and we will also read legends such as, How the Turtle Got its Shell. Storytelling was an important part of Native American culture. In writing, our new unit is called "Making the World a Better Place." Students will write persuasive essays using their own topics. We will discuss the idea of audience, and how knowing the audience you are trying to reach should impact the content of your essay. Our field trip is this Friday morning. Please make sure that your child dresses in layers, as two of the stations will be outside. We will return to Roosevelt in time for lunch. Please remember to sign up for a fall conference if you have not had the chance to do so. Feel free to email me if you need another letter with directions and our classroom code. In reading workshop, we are loving our mystery unit! Searching for clues and details in the story is great practice! We will also focus on self-monitoring strategies. Every so often, readers should pause and ask themselves, "What is the main event? What are the small details that really matter? Can I retell what just happened?" In social studies, we will be studying Michigan's Native Americans. It is a fun and interesting unit in the fall! We will discuss how historians use primary and secondary sources to learn about the past. We will also learn about The Three Fires - The Ojibwa, Potawatomi, and Ottawa tribes. All three tribes occupied Michigan and were closely related in culture and beliefs. They modified and adapted to their environment in order to survive. In math, we will continue to study multiplication strategies to solve different facts (see last week's newsletter). We will also learn more about arrays and how they relate to multiplication. In writing, we are starting a unit on persuasive writing. In general, students will learn to write a thesis (a clear opinion statement) and brainstorm reasons and examples to support the opinion. On Friday, I sent home a letter with information on how to sign up for a fall conference. Please remember to do that as soon as you are able. Have a great week! ​We are starting an exciting new reading unit this week on Mysteries. We will read a mystery book together to learn new reading skills. Then I will hand out mystery books at each child's reading level for independent reading time. The strategies we will discuss, such as using details and clues from the story to make inferences and predictions, can translate to any fiction book. In writing, we finished our unit on personal narratives. Students wrote a final copy last week that I will share with you at parent/teacher conferences. We will spend our writing time this week catching up on other things such as cursive writing and grammar. In science, we will investigate adaptations that plants have in order to survive in their habitats. For example, a cactus has special parts that help it to survive in the desert. A thick stem helps to store water. Spines prevent water loss and protect the plant from being eaten by animals. Shallow roots spread out near the surface of the soil so the plant can collect water quickly when it rains. We will also investigate different habitats around the world. We have a field trip coming up on November 9th! This is a friendly reminder that if you are able, please send in $2.00 with your child to help with the cost of the trip. Have a great week! In math, we are beginning a unit on basic multiplication. At this point in the year, all of the strategies shown on this poster are acceptable for solving problems. In reading workshop, we are learning how to provide "evidence" as we answer questions. "Evidence" means using details and examples from the text to support your response. For example, if we determine that Abby is "responsible," we must find examples from the text to prove the point. What are the functions of each plant part? How does a plant make its own food? In writing, we will study dialogue and learn to use quotation marks correctly when characters in the story speak. In math, students will be learning strategies to subtract two-digit numbers. The removal and the differencing strategies are shown in this newsletter. To solve 53-38, I would suggest differencing because the numbers are close together (it is simple to start at 38 and count up to 53). Removal is an efficient strategy when subtracting a small number, such as 53 - 12. There is a math test this Friday. The study guide is coming home today (Monday). Your child should complete the study guide and return it to school by Thursday. It is modeled after the test, so it should be excellent practice. Please let me know if you have questions about any items on the study guide. In reading workshop, each student will be assigned a reading partner. Reading partners check-in with each other before and after reading time. This gives them a chance to improve comprehension by sharing, asking questions, and applying strategies with another reader. In social studies, we will discuss how humans interact with the environment. These interactions can have both positive and negative consequences. We will soon be taking a break from social studies and moving on to plants and organisms in science. I am sending home a Book It calendar today. Book It gives students the opportunity to meet reading goals each month and earn a personal pan pizza by returning the calendar to school. This is optional, but I strongly encourage every child to be reading at home. In math, we will continue to practice two-digit addition (please see the strategies shown in last week's newsletter). These strategies are building blocks for work that will be done later in the year with three-digit addition. In reading workshop, we will discuss strategies to use when we come across challenging words. This includes chunking the words, trying different sounds, using context clues, and understanding figurative language. In writing workshop, we will focus on two main ideas. First is the idea of a paragraph. Students will be taught to use a new paragraph when there is a new subtopic, when the story has moved forward, or when a new person is speaking. Second, we will discuss revision. Revision is not only about fixing errors - it is about adding more to the heart of the story. In social studies, we will be exploring the idea of movement. How do goods move within Michigan? Why are goods exported to other states? Why do people move within Michigan, to Michigan, or away from Michigan? I will be submitting the book orders after school today, so today is the last chance to make an order. Have a great week! I hope you had a great weekend! This week in Math, we will be using strategies to add and subtract two-digit numbers. Two examples are shown below. The first model uses a number line, and the second model uses an understanding of place value to add the tens and then the ones. In reading workshop, students will be learning self-monitoring strategies. Strong readers self-monitor their own comprehension by pausing and asking themselves, "Who is in this part? What just happened? Does this fit with something that already happened, or is this new?" We will also discuss predictions. A good prediction is made when a reader uses details from earlier in the text to predict what will happen next. If we notice that a character usually reacts in a certain way, we might be able to predict how he/she will react to a new situation. Students will also be taking the Reading NWEA test on Tuesday. In Writing Workshop, students will learn strategies for spelling words correctly as they write. They will also learn how to make strong leads (introductions) for their stories. In Social Studies, we will explore Michigan's climate and vegetation, and how they impact our economy. Spelling words were sent home last Thursday. Thank you for helping your child to prepare for the test this Thursday. I am sending home a book order that will be due on Monday. If you choose to order, please do not send cash or checks to school. All orders will be done online. Have a great week! We are off to a great start! Thank you for helping your child to prepare for the school year! In Reading, our first unit is called, "Building a Reading Life." Students will learn to choose good-fit books, set goals, and build reading stamina. We are also reading a story called Stone Fox together. As we read, we are practicing a variety of strategies such as analyzing characters and using details to make predictions. Students will learn to apply these same skills as they read independently. In Writing, our first unit is called "True Stories." Students will brainstorm small moments in their lives that they might like to turn into stories. There will be time to write each day and there will be mini-lessons to help students improve their writing. In Math, we are reviewing addition and subtraction strategies, and eventually using these strategies to solve larger problems. Math homework is coming home today and it is due on Wednesday. In Social Studies, we are discussing the larger places to which our community belongs (Berrien County, Michigan, United States of America, North America...). We are also discussing the natural features and the human-made features that make our community special. There is no spelling test this week. This Thursday, I will hand out the words so that students can begin studying for the test that will take place on Thursday, September 20th. Both sessions will begin in the gym with Mrs. Pennington. Then you will go to your child's classroom.